Zach – this season is better than any other season.. the way things are lined up the people we have . Celebrating that Bruno and Bobby are on board. Brittnee – He’s going to be so shocked. Sindy – the look on their faces.. They both wanted to work with Jordan but he’s just too close to Zach. Brittnee – he’s playing his game for Zach right now. Bruno – you notice how Cocky JP was all week.. he’s talking about next week next week.. Buddy next week you’ll be sitting at home buddy.. I love it Sarah..
Zach – If I get power in a week or two.. I don’t know who I will knock off. Bruno says once Zach is gone if Kevin doesn’t sign up with them then he’s gone.. All they have left is Pilar and Ashleigh. They feel confident those girls will not pose a threat in the competitions. Bruno says that Sindy wants to work with him but he’s not in an alliance with her. Bru – All week she’s been walking around like a f***g princess.. Zach’s been walking around all tough.. JP is all confident. bruno says they should have taken JP off and put Bobby or him up. That is what he thought was going to happen. Bruno points out that Sarah and Johnny were after him last week. they agree the only reason they would put each other up is if they wanted each other gone.. Never as a pawn. Godfrey – they got too cocky.. They agree if they stuck with Zach’s plan they would have been picked off one by one. Bruno says JP and Zach hadn’t talked to him in over a week he knew something was up. They point out how Zach, Willow, Ashleigh and Jordan are always together. 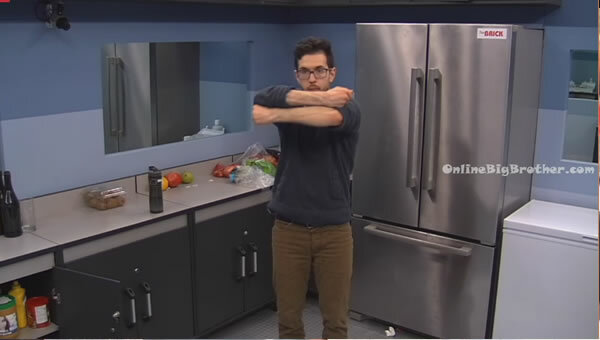 Bruno recommends if they win HOH be nice to everybody talk to them all because you never know what will happen. Bruno – We have to have to have to win HOH tomorrow..
Bruno – He took his own guy out man.. there’s gotta be a twist coming I hope it’s not tomorrow. 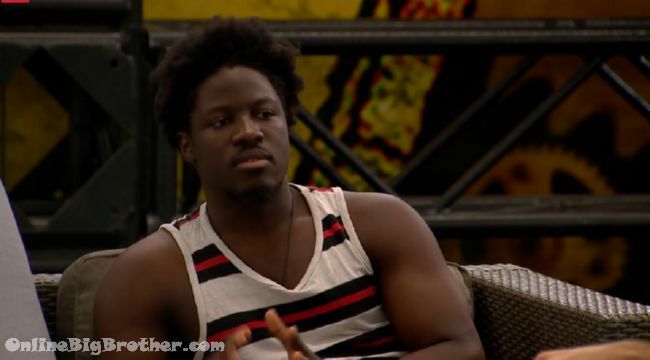 Godfrey starts telling Bruno how Jordan was interrogating him this week. Explains all the sh1t Zach and Jordan were feeding him all week. How Jordan was always moving the target off Kevin and suggesting Bobby and Bruno. God brings up Jordan was saying Bruno was a dad and he should go home before jury. Jordan told God that bruno has in tight with Bobby and he also tried to make a final 2 with Jordan. They told Godfrey if they used the POV on him and Bruno went home Godfrey would have to put up Bobby if he won HOH. Godfrey explains how he had to play along with them. They agree if they win HOH Ashleigh and Zach are going up Willow will be the replacement nomination. Godfrey wants bruno to make sure the girls are still down with keeping him. Godfrey is going to act sad. God – They’re going to pay trying to get me out this early.. I’m going to put this guy up just to see the look on his face. Bru likes Brittnee and Sindy he’s never talked game once with Sarah . They laugh not knowing who to look at when the vote goes down. Godfrey hopes they all sit on one side. Bruno wants to make sure he’s sitting across from them. For 10th time bruno tells him he will never put Godfrey up and anyone he says he’s going to is a liar. God mentions how Cocky Willow was getting telling JP he was going to feast tomorrow night once he’s not a Have not. Bruno – he(Jordan) was talking about next week with me. Explains he was talking about bruno and jordan being a have not next week. They agree Jordan cannot keep up with all his stories. God brings up Graig coming up to him after the first couple hours talking about alliance. Jordan says he treated kevin like Sh1t the first half of the game. 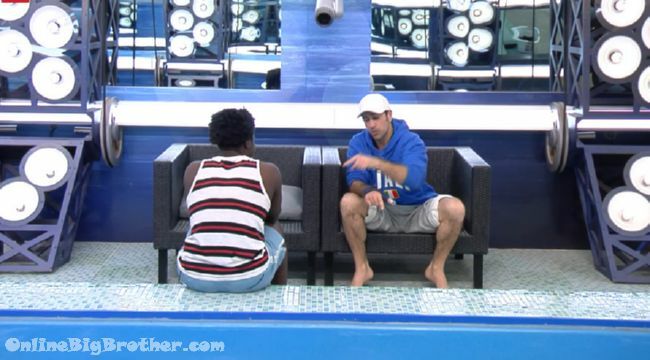 Jordan – I’m in with Zach 100% and in with Kevin 100% ..
Jordan for some reason is telling us that the chop shop is controlling everything, running the game. Jordan – Mom dad I love you so much don’t worry about me I’m going to be fine.. these next couple weeks are goign to be insane.. with bobby winning the veto it’s very bad for my game.